Leading the team of wedding photographers is a professional with all the experience needed to ensure your day will be a great success. In the course of his 25 years experience in wedding photography he has freelanced for the five of the largest photo studios in Essex - most often with their accolade of "preferred wedding photographer". He says. "Since then I've always made it my business to enhance the day by working creatively with speed and efficiency. 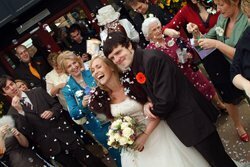 I love taking weddings and I thoroughly enjoy myself, whilst ensuring that so do the Bride, Groom and all the guests. I'm known for injecting a bit of humour into proceedings which always helps to calm the nerves!" Every photographer is hand picked not only on the most important thing, their wedding photography skills, but also on the basis of making it not their day, but your day to remember. Is it a special occasion - anniversary or birthday? A Friday night out or that special photo for a loved one? None of those? - Just want to feel great? You have come to the perfect place. Your makeup professional will make you feel your best and look stunning! It could end there, but why waste the opportunity for really memorable photos? Every one of our photographers has at their fingertips all the techniques used by the stars. The results are breathtaking and to be treasured forever. Choose mounts or a special frame to compliment perfectly your new look.